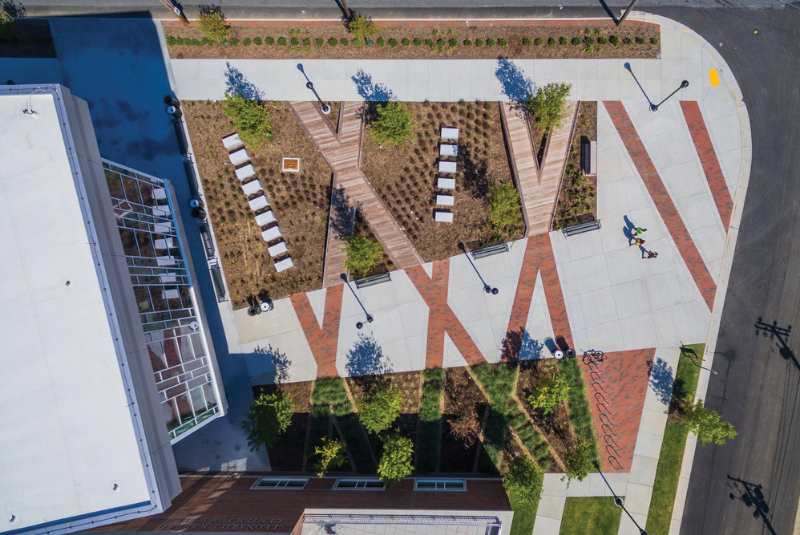 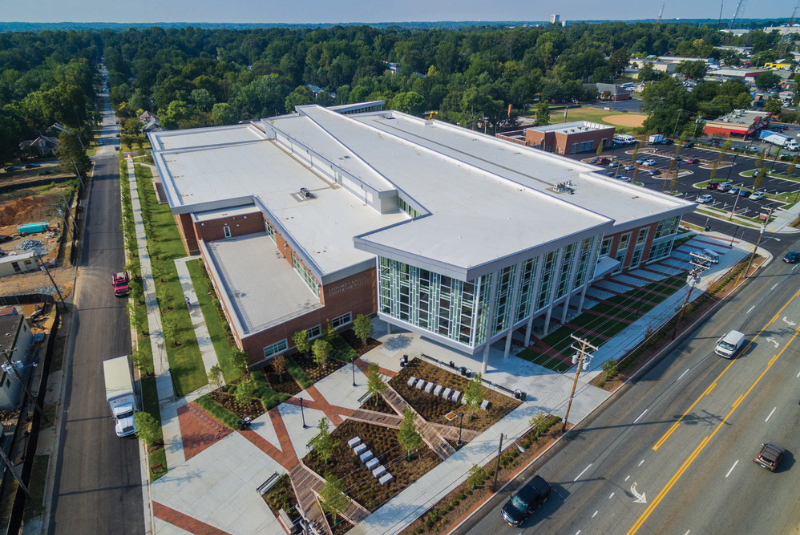 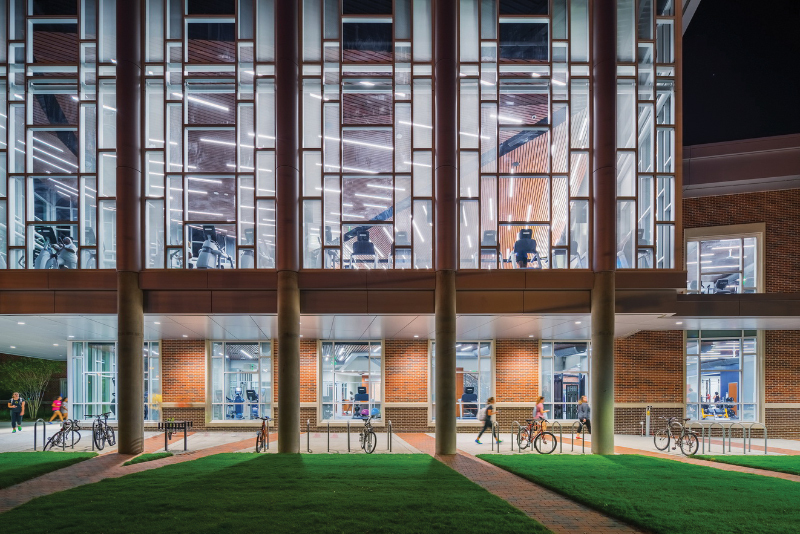 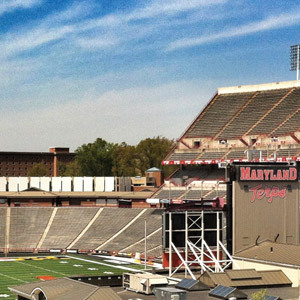 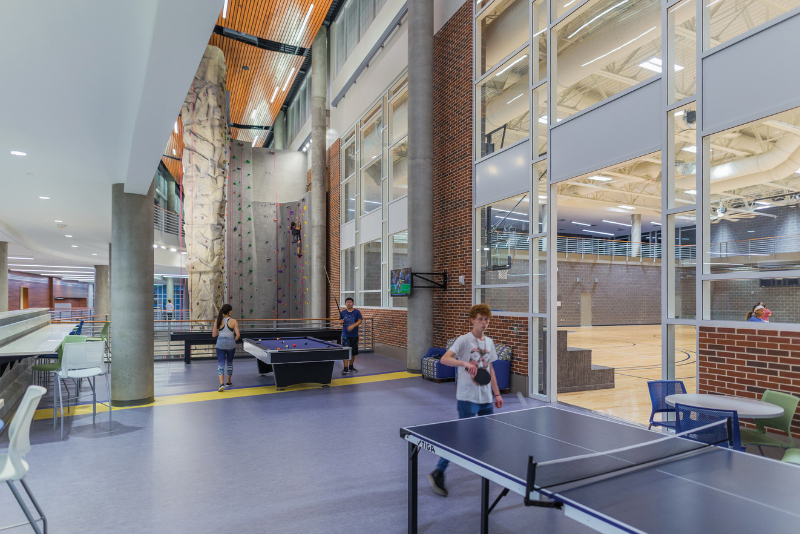 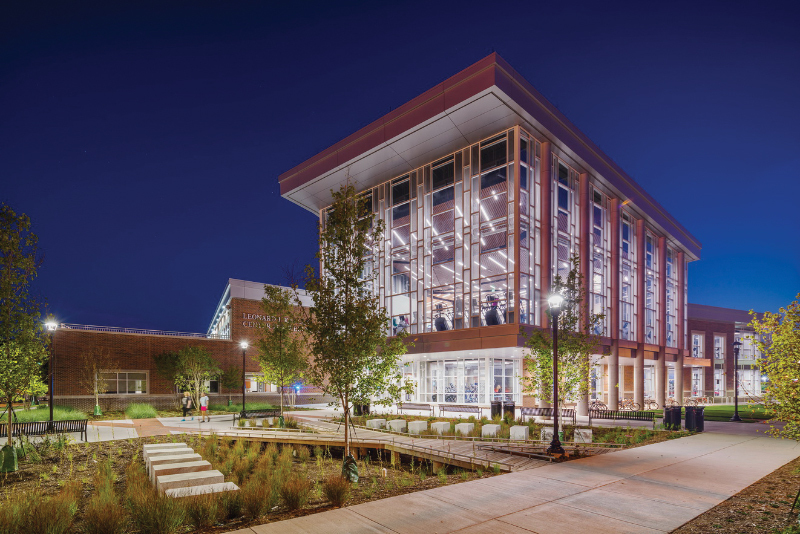 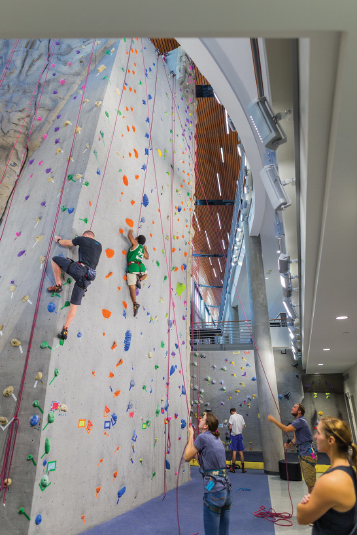 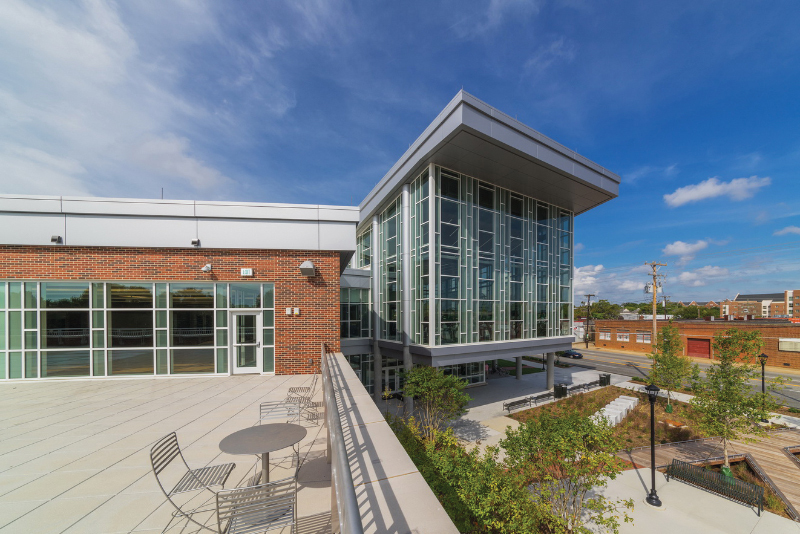 When the university intentionally expanded their land holdings, it envisioned a campus community anchored by a dynamic recreation center surrounded by student housing and student focused spaces. 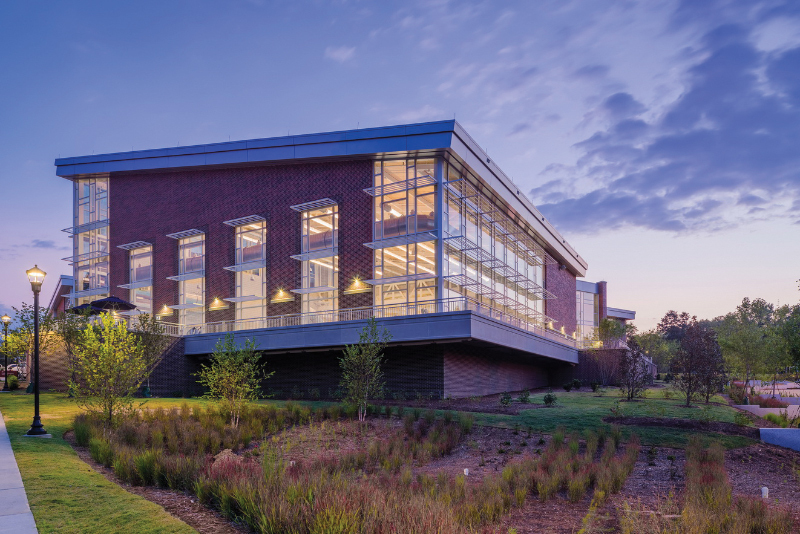 Organized on three levels, the building has an unbelievable high-transparency interior. 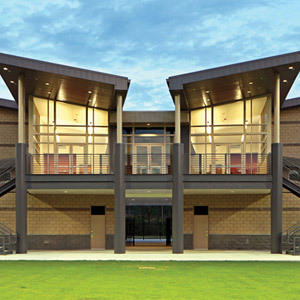 It is a place to see and be seen. 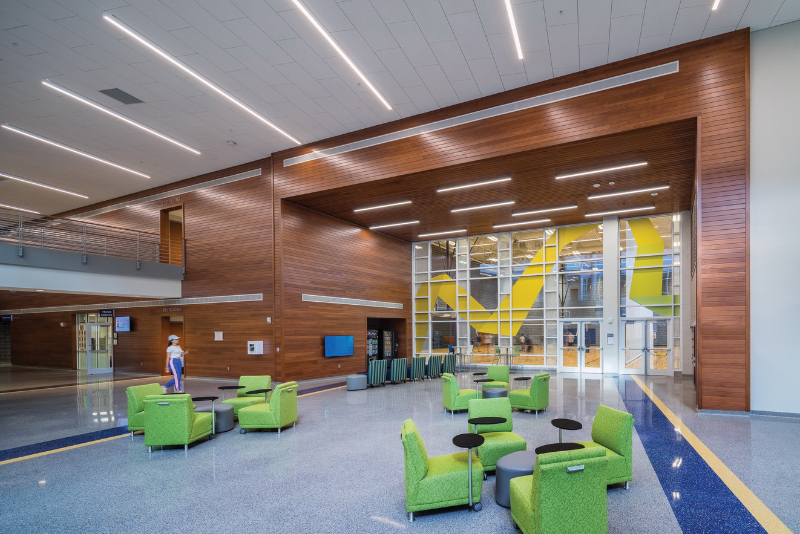 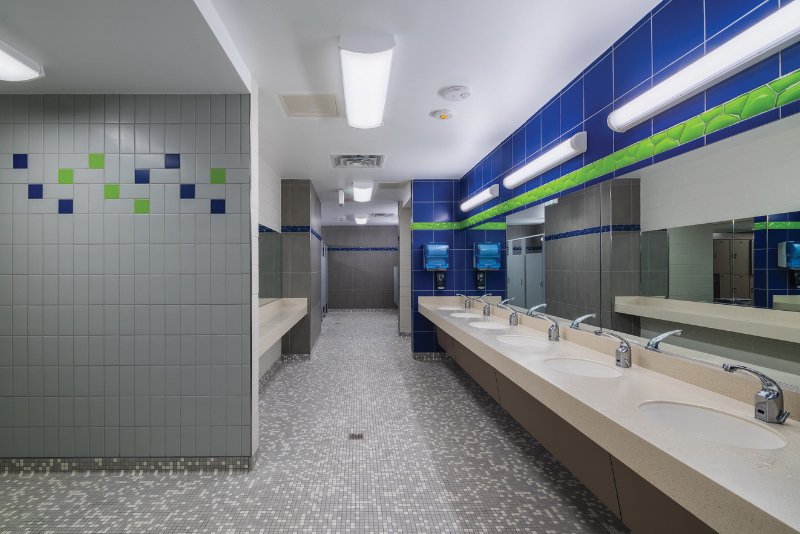 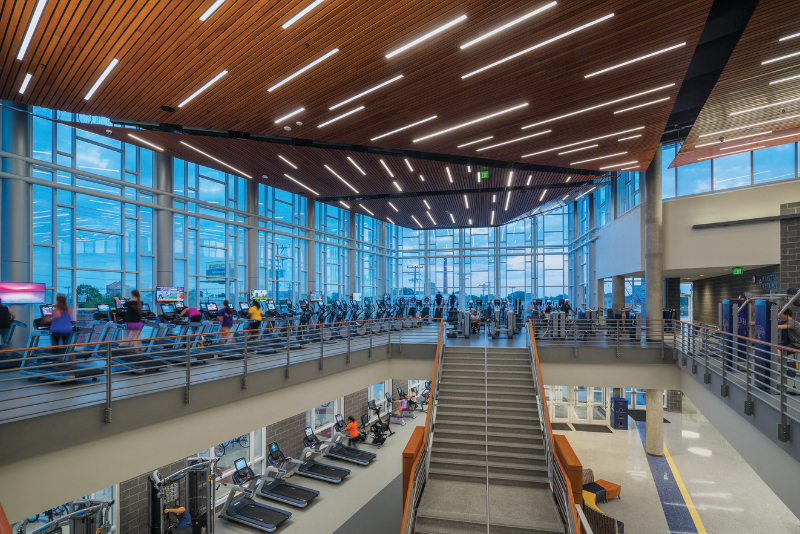 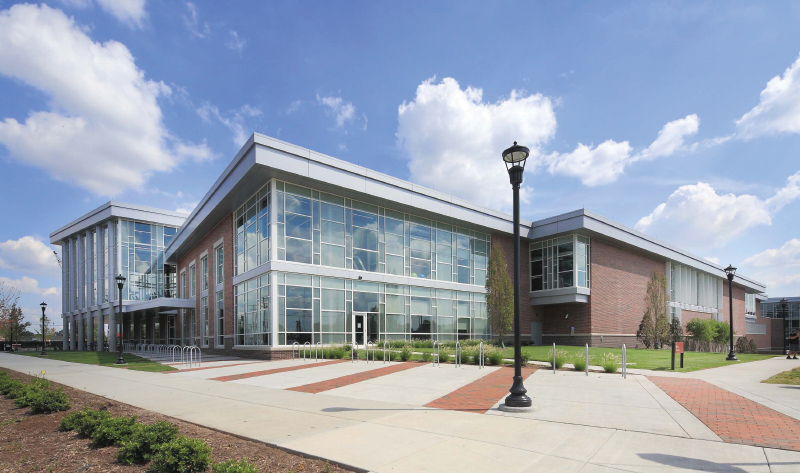 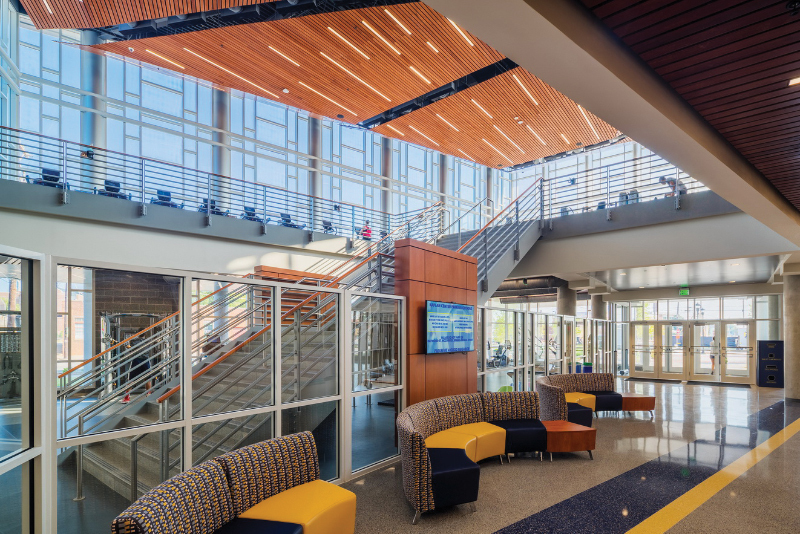 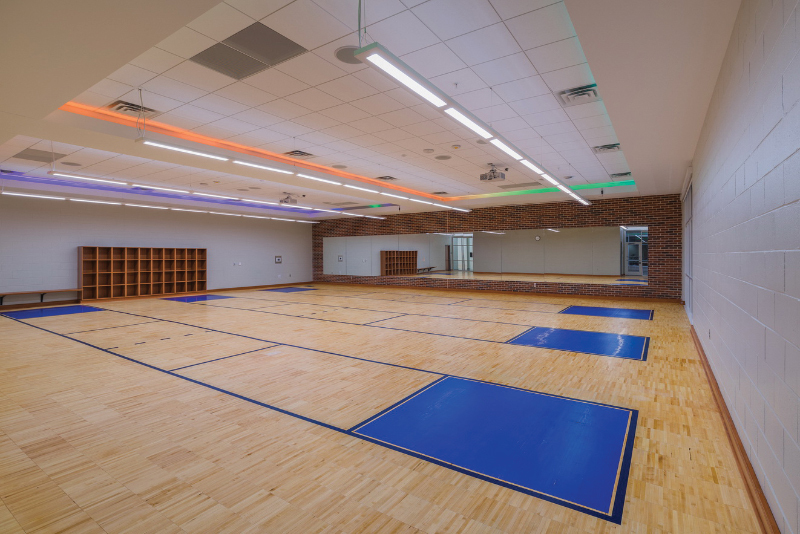 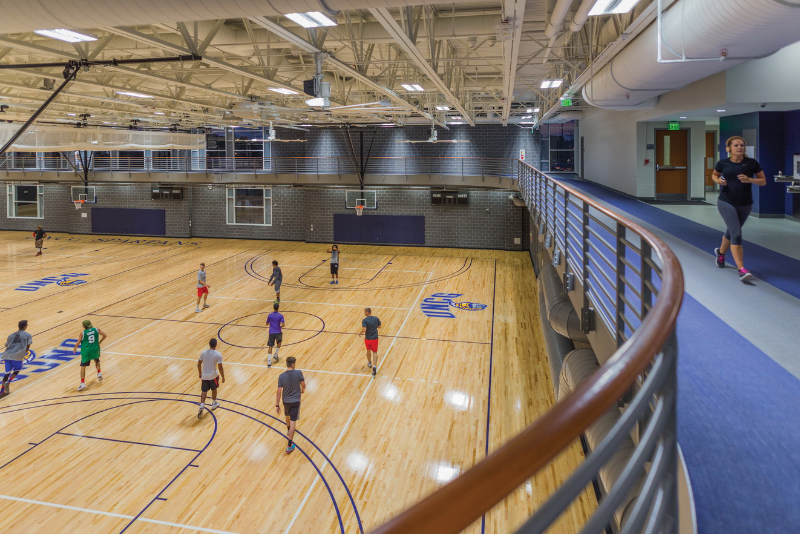 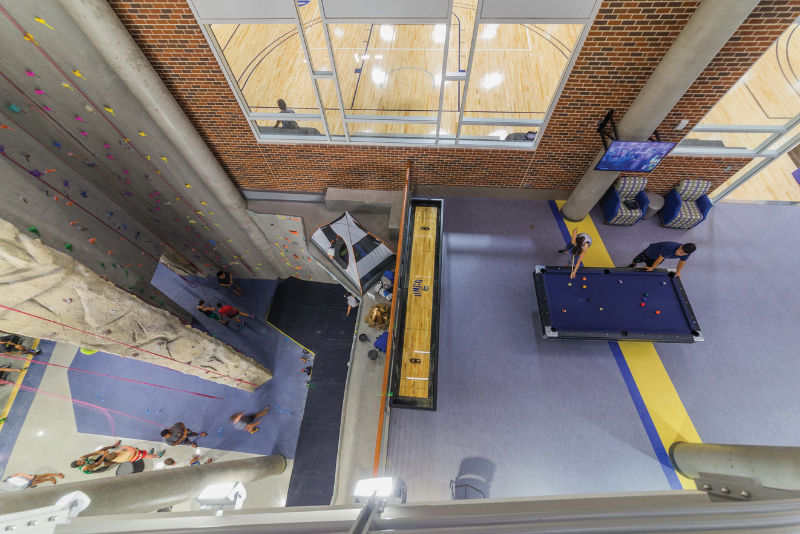 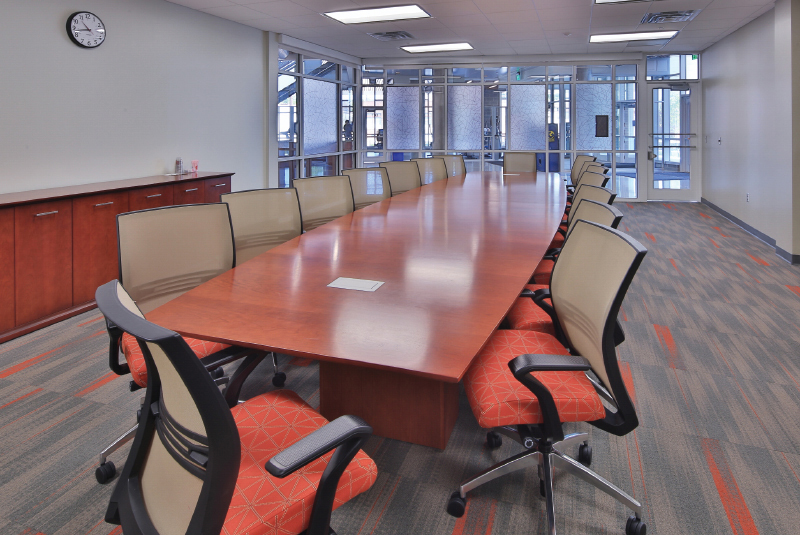 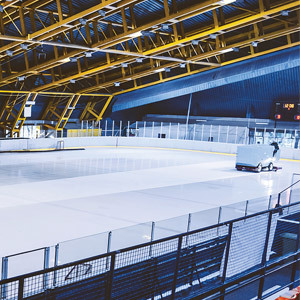 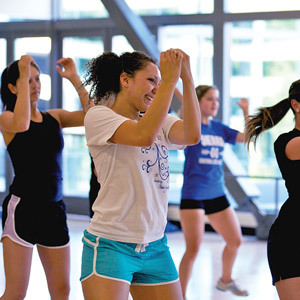 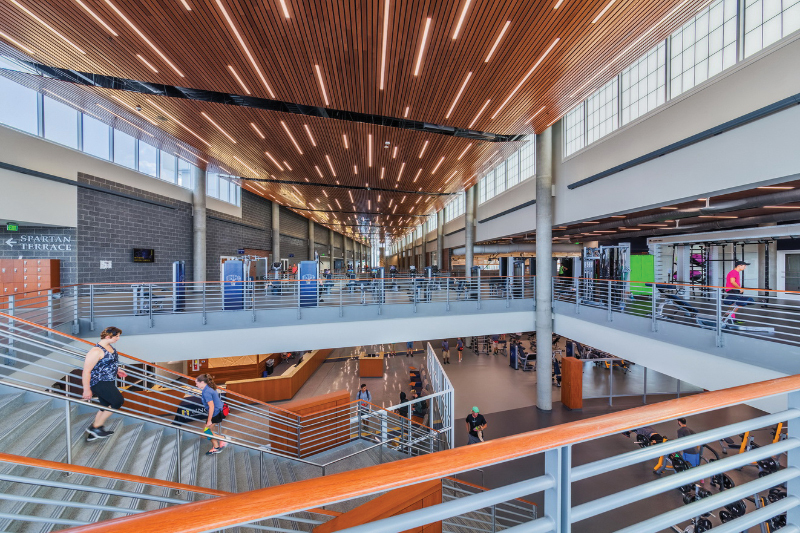 Level Two is the main entry level, and patrons can readily access many free-zone spaces in front of the control desk, including the administrative office suite, a shared-use conference room, a club sports suite, an intramural suite, multipurpose classrooms and more. 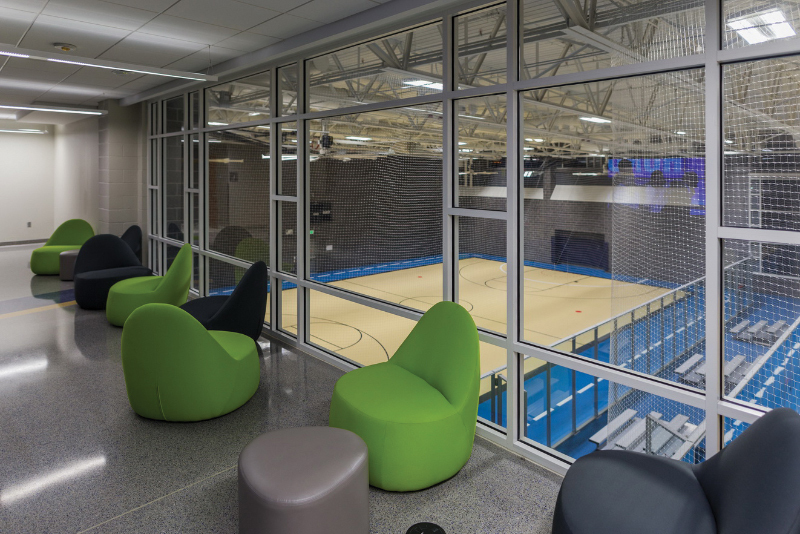 Just beyond the control desk patrons can readily access the main weight training and fitness area, five of the seven gymnasium courts, equipment issue, functional/core training space, a cycling room, racquetball courts, lounge areas, a table tennis and billiards area, and more. 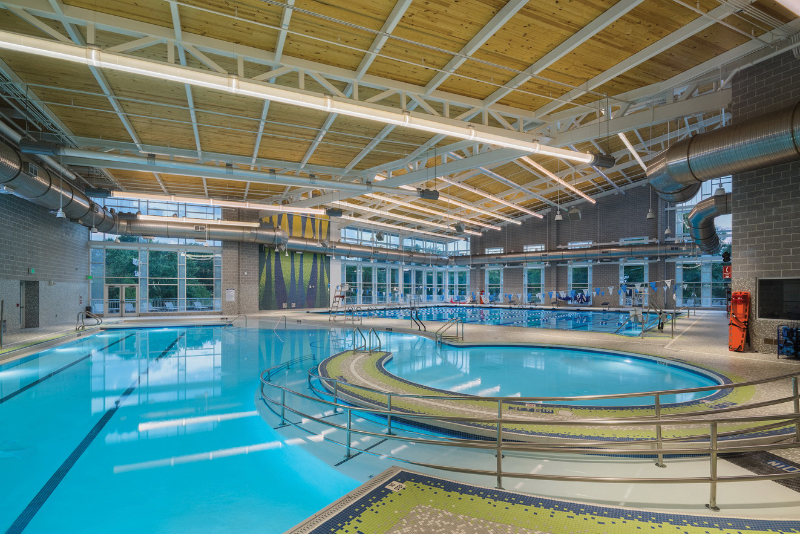 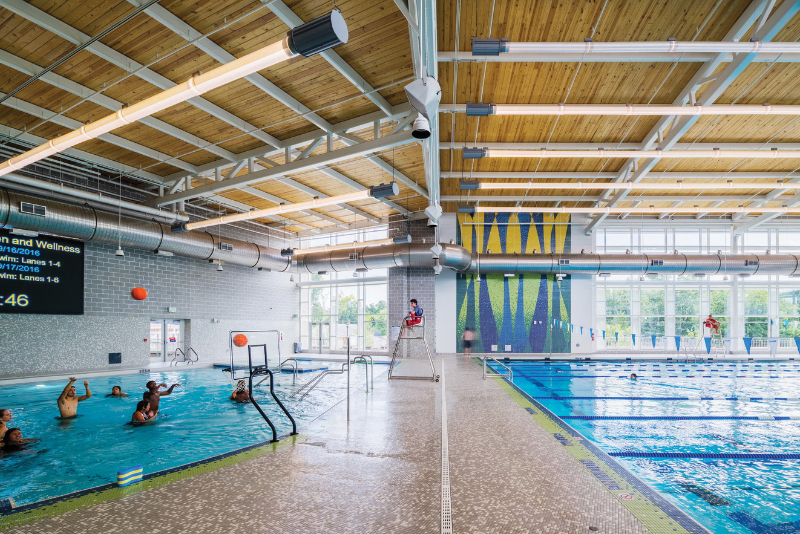 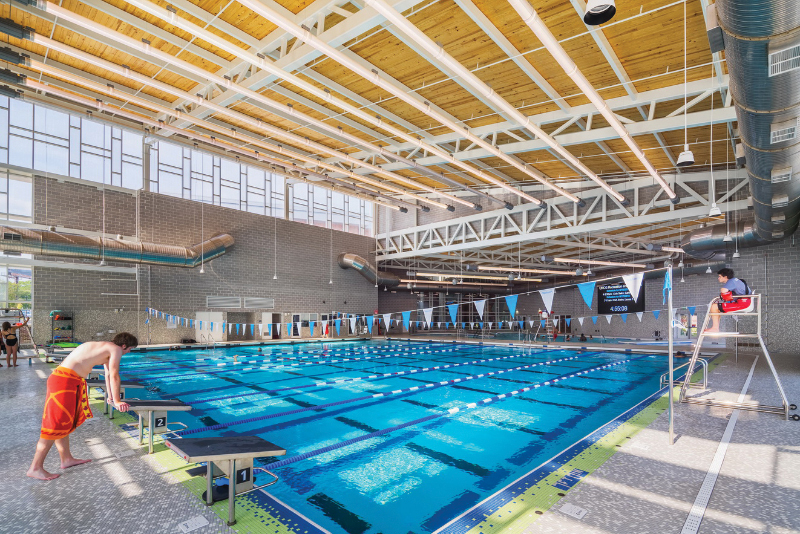 Level One is about 40 percent of the building footprint, yet it provides space for two gym courts with a 35-foot overhead clearance; the natatorium with a 25-yard by-25-meter lap pool, a large leisure pool with a vortex and lounge ledge; locker rooms (traditional and family/gender neutral); the outdoor adventures suite with a multipurpose meeting room, equipment storage, a work area, a climbing wall and a bouldering wall; significant collaboration and lounge spaces; and a substantial outdoor sun deck and patio space off the pool deck. 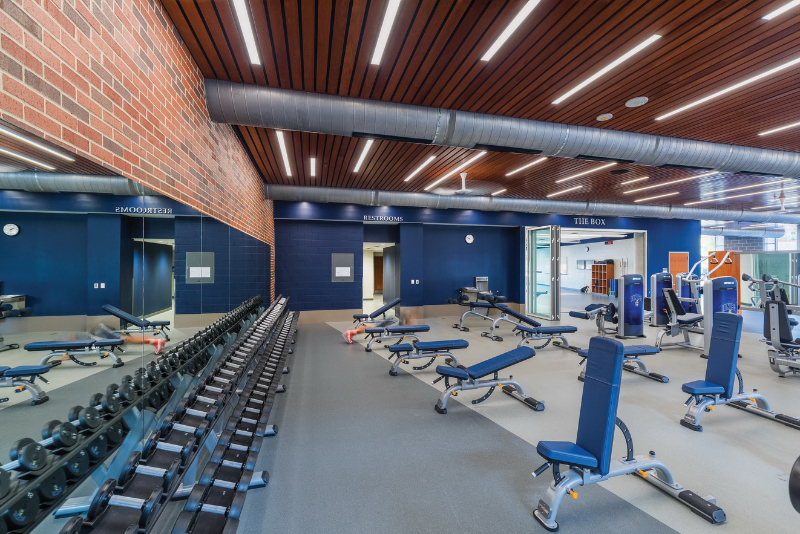 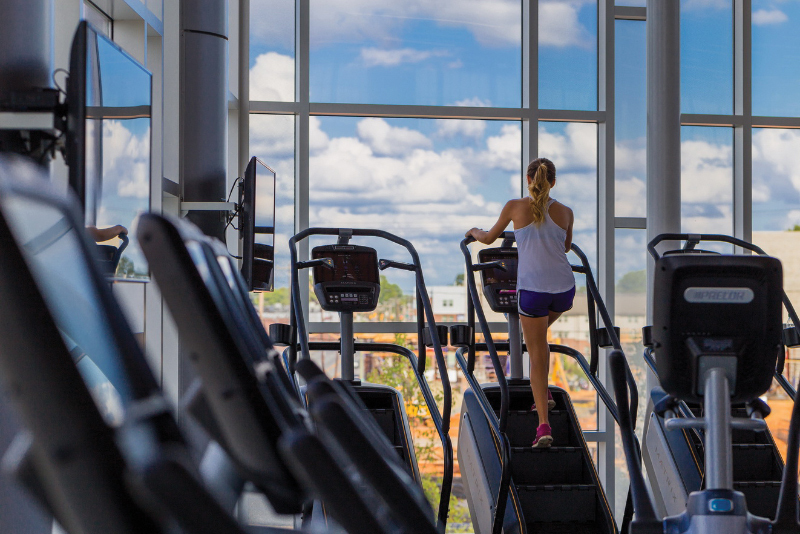 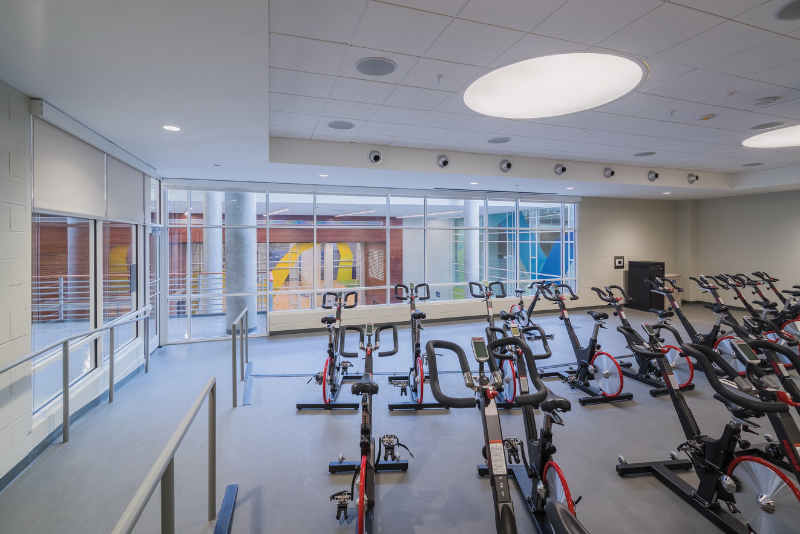 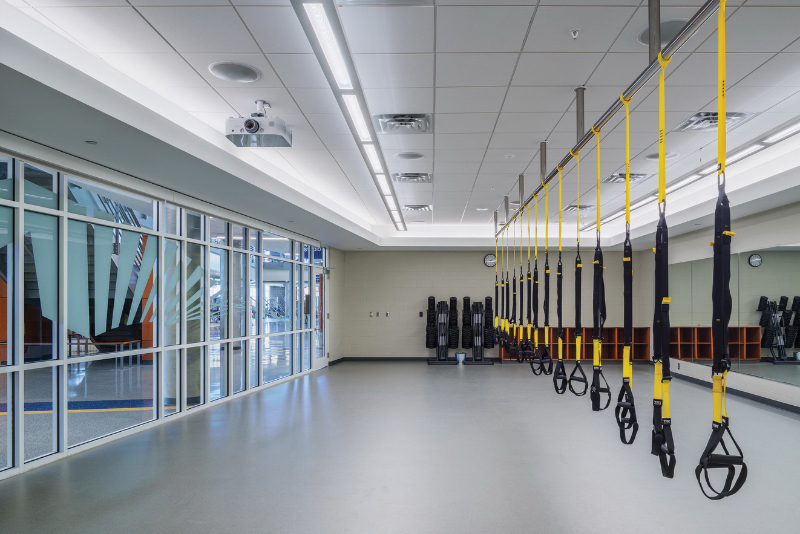 Level Three includes the three-lane, 1/8-mile jogging track, multiple group exercise spaces, an outdoor rooftop exercise patio, more weights and fitness space, a mat room and the personal training suite. 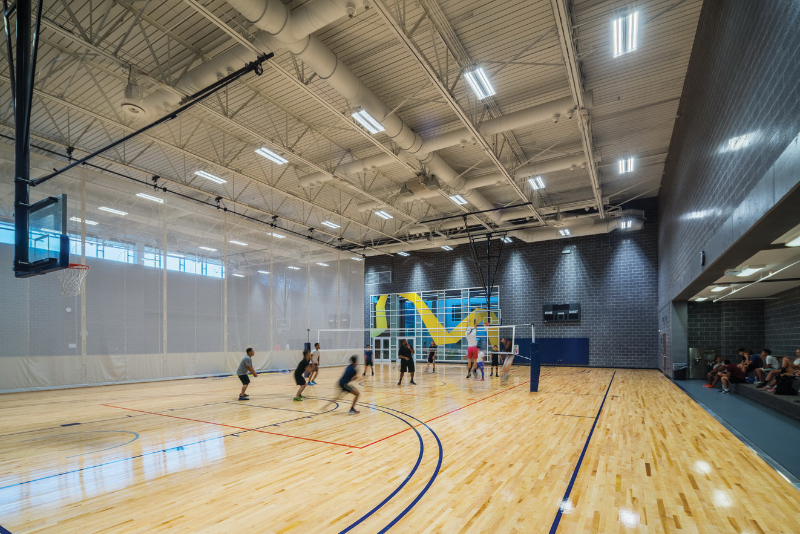 Gymnasium/Field House/Arena - Basketball Backboards/Supports: Arizona Courtlines Inc.
Gymnasium/Field House/Arena - Divider Curtains: Arizona Courtlines Inc.
Gymnasium/Field House/Arena - Wall Padding: Arizona Courtlines Inc.
Locker/Shower - Lockers: Summit Lockers Inc.
Racquetball/Squash Courts - Court Panels/Glass Walls: Hollman Lockers & Courts Inc.